We’d love your help. Let us know what’s wrong with this preview of A Parliament of Bodies by Marshall Ryan Maresca. The city of Maradaine is vexed by the Gearbox Murders: a series of gruesome deaths orchestrated by a twisted mechanical genius. With no motive and no pattern, Inspectors Satrine Rainey and Minox Wel Mixing high fantasy and mystery, the third book in the Maradaine Constabulary series follows Inspectors Satrine Rainey and Minox Welling as they track down a dangerous murderer. To ask other readers questions about A Parliament of Bodies, please sign up. 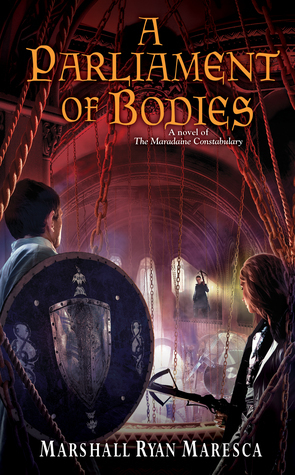 A Parliament of Bodies is the third installment in author Marshall Ryan Maresca's The Maradaine Constabulary series. The Maradaine Constabulary series unveils a different layer of the city, on the side of the law, as opposed to the criminal underbelly in the Maradaine novels and Streets of Maradaine. This series features Satrine Rainey and Minox Welling, two detectives in the constabulary who protect the city of Maradaine from crime. I'm a huge fan of the world Marshall Ryan Maresca has created. Each character in every series is multi-dimensional and the slow build towards the larger plots is intricately crafted. A Parliament of Bodies moves us another step closer to the complete interweaving of the seemingly disparate series set int he same world. I'm still waiting for that moment where Satrine Rainey and Asti Rynax cross paths. This latest installment in the world of Maradaine is the third book in the Maradaine Constabular I'm a huge fan of the world Marshall Ryan Maresca has created. Each character in every series is multi-dimensional and the slow build towards the larger plots is intricately crafted. A Parliament of Bodies moves us another step closer to the complete interweaving of the seemingly disparate series set int he same world. I'm still waiting for that moment where Satrine Rainey and Asti Rynax cross paths. This latest installment in the world of Maradaine is the third book in the Maradaine Constabulary series. Of the four existing series, the Constabulary is my favorite (although the Streets of Maradaine is a VERY close second because HEISTS). Satrine and Minox are underdog characters who have found there way and found much needed support within each other. A Parliament of Bodies provides such a clear example of the importance of the relationship. It also shows us the greater support Minox Welling, an untrained and potentially unstable mage, has with his friends and family. Which also makes this book hurt your heart that much more. I never expected the title of the novel to be literal, but it is. And somehow that isn't nearly the most wrenching part, which is saying a lot. This book expertly begins to slowly put the pieces together from the larger conspiracy working it's way through all of Maresca's novels. So much so, that Dayne and Jerinne, the Tarians from The Way of a Shield play an important role. As does Verci Rynax - though you'd only know it's him if you've read the Holver Alley Crew. But that isn't necessarily a requirement which is the brilliant part of things. This book stands on its own from the other three Maradaine series. There is enough explanation to allow you to grasp all that is happening without the other series. That said, this book is infinitely more meaningful and more enjoyable with that larger understanding. And it makes me clamor for the next book, particularly the next in the Streets of Maradaine. The larger intrigue and conspiracy is so tantalizing. I want more and I want it now. But until that happens, I will gladly reread A Parliament of Bodies to ponder over every clue and work out the connections, much like Minox Welling would himself. I was hooked right from page one, and by the time I'd gotten halfway through it, I realized my day was gone! Maresca writes amazing characters with realistic interactions. One of my favorite things about his books is how real the relationships feel. He doesn't lean on lazy tropes to forward them. This book is the crossover I didn't know I needed and I love it, though it broke my heart. I anxiously await the next installment. I'M SCREAMING!!! WHAT DID I JUST READ!!!! I NEED MORE!!! I seriously thought I was emotionally invested before but, oh, boy, was I wrong. Like, without spoiling anything, some many twists. Up until quite literally the last page. What's going to happen with Minox and his hand? What about Corrie? And Satrine and Phillen Hace??? So many things. I can't handle this. I need the next one in my hands. Shield of the People better alleviate some of my questions but I fear it'll just add more. Wow! A gripping read, this book had me up past my bedtime wanting to know what happened next. While this book succeeds as a standalone work, the greater joy for the reader is to see more of the overarching mystery that has been woven through the series since book 1. Some mysteries have been finally answered, but greater mysteries are still ahead. I can't wait to see what happens next! The constabulary series that this book is part of is my favorite, although I’m fond of the Thorn books, but his other ongoing books within the larger, intertwined work I’ve not been much interested in. That being said, you can read this as a stand alone, although obviously if you e read the others it will make it a deeper experience. I definitely felt like I was missing a few pieces. Because I read books more for the characters than the plot, I found this book disappointing since it’s focus was The constabulary series that this book is part of is my favorite, although I’m fond of the Thorn books, but his other ongoing books within the larger, intertwined work I’ve not been much interested in. That being said, you can read this as a stand alone, although obviously if you e read the others it will make it a deeper experience. I definitely felt like I was missing a few pieces. Because I read books more for the characters than the plot, I found this book disappointing since it’s focus was more on this grand conspiracy Maresca has been building toward. Rainey and Welling spend most of the book chasing after the so-called Gear Box Killer, a demented mechanical genius who enmeshes his victims in elaborate clock-work killing devices. I found him tiresome, his killings needlessly gory and horrifying and of course, he’s just a cog in a larger wheel. The various threads start to come together... Which is good, in a sense, but leaves less words for the A-plot. Received an arc from netgalley. This is the first in this series that I have read. Loved it and need to get the first 2! Definitely recommend.